Pictures of Fraser. A free flowing river. 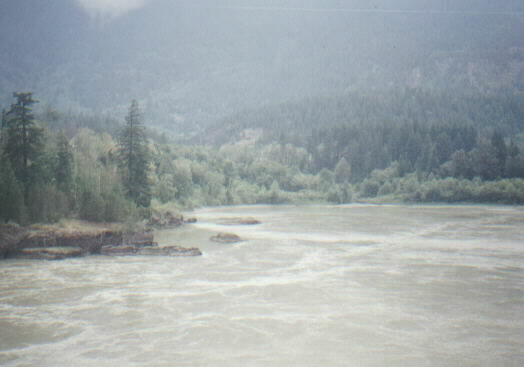 Crossing Fraser River at Hope, BC. in Canada. Most large and swift moving rivers have been turned into placid lakes with dams. The energy of their flows have been channeled into strands of wire and turned loose to vacuum our floors. The Fraser is rare as it still flows free. Standing on a bridge at Hope, one can sense "energy" as the water roils past, coming out of mountains. Closer to Vancouver, River's energy diminishes as it enters its delta. 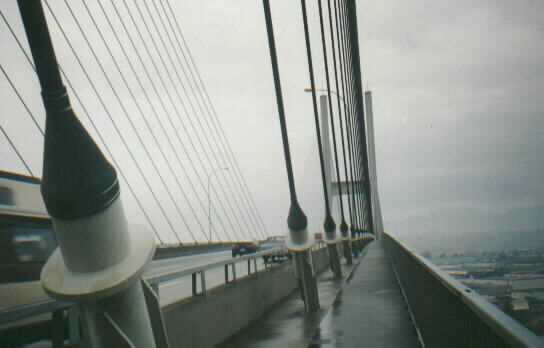 Alex Fraser Bridge provides another dramatic crossing; stayed cable suspension. Crossing the Fraser, more pictures of the bridge.